The art, science and technology of medicine have co-existed relatively peacefully for many years; however, this situation is changing. Science and technology are advancing so fast that medicine risks being dominated by them. Nevertheless, there is increasing disquiet about leaving qualities like empathy and compassion, which constitute the art of medicine, tacit. Doctors are increasingly held to account for their art, which has resulted, for example, in a proliferation of measurement scales for empathy or Emotional Intelligece. Failures in Mid Staffordshire and the Winterbourne care scandal have led people to say that we should explicitly develop caring amongst doctors and the health professions. Ethicist Anna Smajdor went so far as to question if it is still possible for patient care to have an emotional dimension . Many people might, however, be appalled by her idea that healthcare cannot, under present conditions, be fundamentally different from the care we receive in a hotel. I, and my colleague Jonathan, amongst many others, think that there is an affective dimension to medicine, which society would lose at its peril. Medical philosopher Kieran Sweeney argued that the tension between the humanistic and technical aspects of medicine goes back to the times of the ancient Greeks . He did so using a Greek myth where Hygeia stood for the promotion of health, whereas Panacea stood for medicine as the “warrior” against the state of disease. The Panacean view prevailed with the Medical Act of the 1858, which instituted the General Medical Council, establishing medicine as a profession assigned to defeat disease. This was the point where the science of medicine established dominance over the art of medicine, which I think is reflected in the way we deliver medical curricula. Medical students confront professional dilemmas with an emotional impact  that influence their identity development; the need to address the “ever-present absence” of emotions in medical curricula has recently been raised by McNaughton . There is no doubt that medical education requires professional values to be made explicit, hence we (Jonathan and I) are attempting to contribute to the discourses of emotions and compassion in healthcare by exploring ways to cultivate an increasingly humanistic view of the medical profession in our future doctors. We have recently started a project, called “The Doctor as a Humanist: Humanities in Medical Education”, which will unfold in three phases. Phase 1 will be aimed at running a pilot educational intervention to groups of 4 to 6 medical students from some international Universities. The intent is to add an element of inter-cultural communication to hopefully further stimulate students’ reflection. The pilot will then be evaluated and discussed at a Symposium (Phase 2) in October, where one student representative from each participating Medical School will be invited, amongst a small group of educationalists and clinicians. The aim of the symposium is to further develop ways to include the humanities in the medical curriculum and to hopefully begin the design of a more established curriculum element (e.g. SSC or intercalated degree) to be implemented and evaluated in a 3rd Phase. In a recent book on Medical Humanities , the authors explain how the humanities can contribute to “cultivating personality, intellectual curiosity, emotional honesty, social awareness, and the exercise of sound judgement and moral imagination – virtues and skills indispensable to good doctoring”. Likewise, our global project aims to reintroduce this humanistic vision to medical education, and thus to counteract the ever-increasing over-dependence on technology. It hopes to teach future medical doctors that a balance between the “scientific” and the “humanistic” is essential for their future medical careers. They will be treating humans and thus need to know as many aspects as possible of what it means to be human in the twenty first century, and this project believes that the teaching of works of literature will help them towards this goal. Do let us know if you wish to be updated or involved in this exciting project! Smajdor, A. (2013). Reification and compassion in medicine: A tale of two systems. Clinical Ethics, 8: 11-118. Dixon, M, Sweeney, K. (2000). The human effect in medicine: theory, research and practice. Radcliffe Medical Press, Oxford. Monrouxe, L, Rees, CE, Endacott, R, Ternan, E. (2014). ‘Even now it makes me angry’: health care students’ professionalism dilemma narratives. Medical Education, 48: 502-517. McNaughton, N. (2013). Discourse(s) of emotion within medical education: the ever-present absence. Medical education, 47: 71-79. Medical Humanities: An Introduction, Thomas R. Cole, Nathan S. Carlin, Ronald A. Carson; Cambridge University Press, 2015. Open data as OERs offer new opportunities for innovation in medical education which merit further exploration and research. Specific areas of potential include topics such as public health, global health, prescribing and patient safety, health inequalities. There is also potential to integrate open patient data into simulation to support authentic learning. There is no doubt that Medical Education, albeit slowly, is starting to conceptualise innovative ways to make use of open data. The literature documenting case studies is still scarce, therefore medical educationalists currently need to rely on their own creativity and pedagogic expertise to design educational interventions based on open data. If this interests you, please read this Blog post. It has taken mi few days to reflect about what has happened in the country I called home for the last few days, it has been sad, confusing and overwhelming. Just a quick post to share something I’ve been thinking about lately. 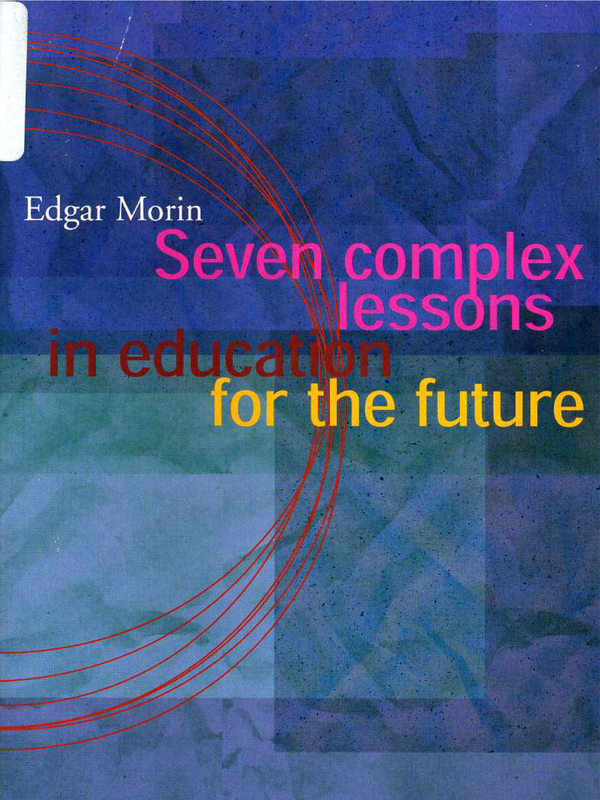 Some of my colleagues will know how much I like a book from French sociologist Edgar Morin: Seven complex lessons in education for the future (2002). As the years go by this is probably the one book I would suggest reading to all teachers, but also students and generally to those involved in education. In his book, Morin describes seven basic principles for future education, which are fundamental yet too often ignored. These seven principles highlight the importance to educate future generations to understanding the human condition, how knowledge is formed and what are the possible errors in this process, the importance of understanding each others and confronting and accepting uncertainty and complexity. These subjects are not only very contemporary, but also particularly important in healthcare education, where students need to raise their eyes from the micro-cosmos of the basic sciences to the macro-cosmos of social health issues, understanding how the two are interwoven and continuously inter-influenced. As this week I was thinking about how “Human Sciences” subjects are being assessed in medicine, I had of course think of how they were taught. It would be nice to see if Open Data could be used to teach students about the “human condition” and general World Health issues. Something is starting to move in this direction. How could open data be used in Medical Sociology teaching, for example? I would be particularly interested to see whether using open data as OERs, to facilitate students’ critical understanding of socio-cultural elements influencing , for example, health issues could nurture compassion. #Rhizo15 Week two – numbers, and a semi-organised flow of thoughts. Pedagogy was born as “applied philosophy” in the Ancient Greece, so mostly a subjective, dialogic matter. However during the 8th century pedagogy acquired the status of “science” trough the tools of biology, psychology, sociology, using them to define its own aims and tools. This until when, through various reinterpretations over the centuries, in the late 19th century pedagogy reached the point to define itself on strict experimental and empirical basis, often taking a reductive and anti-humanistic turn . We have now passed that point though. However, while in the current academic contexts pedagogy sits between philosophic, scientific and critical paradigms, it seems that the scientific, measurable part still gets the upper hand. Especially with the use of emerging technologies in education, educators aim to “make learning visible” through these tools, which in part is absolutely great. I say in part, because have my own views on this matter, and these fall mostly in in favour of the dialectic, qualitative domain rather than the quantitative. Personalized learning, while customized for the student, is still controlled by the system. A district, teacher, company, and/or computer program serve up the learning based on a formula of what the child ‘needs’. Shouldn’t we be allowing and supporting learners to develop personal learning landscapes, instead? I think it is far too easy to equate meaningful participation, or learning, with numbers coming from analytics. @e_hothersall, @nlafferty and I have recently wrote a conference paper on a Twitter experience with medical students. We used SNA to look at students’ engagement, however it was quite clear that the number of tweets or mentions doesn’t account for the deeper processes of learning. They can offer an initial evaluation (and beautiful, colourful charts! ), but without careful content (or discourse) analysis the portrait, in my opinion, is rather incomplete. In medical education, but I’m sure not only here, metrics seem to prevale as objective ways to evaluate students, their participation, depth of learning, engagement. Sometimes we count whether and how many boxes they have ticked in their online portfolios, which should provide evidence of an achievement. This happens even with things such as empathy or emotions. Not only we aim to make them more explicit, but we want to do it in such a way that they can be measured. This is perhaps because doctors are increasingly held to account for qualities such as empathy and compassion. One consequence of this tendency has been, for example, the development of measurement scales; 38 different measurement scales for empathy, for instance, were described in a recent review . The construct of Emotional Intelligence (EI), used within the medical academic environment to define a set of skills in which students are “trained” and then assessed for, serves exactly the same reason. Emotions are captured and measured from their instrumental use, which manifests itself in certain skills, behaviour and patterns of communication that can be learned, practiced, observed and evaluated. This is what the psychometrics era brought in education. Measures to objectively evaluate and quantify students’ performance. But, where do the subjective and the collective fit? I think we are slowly correcting this shift, and last week theme in #rhizo15 is the proof. Also, hybrid, critical pedagogies (see, for example @HybridPed) are surely highlighting the value of dialogic, unfixed, complex and dynamic elements, which cannot be quantified in education. P.s: As humans, though, we tend to quantify, even socially. Social Media tools have exasperated this tendency… Don’t we all get a sense of increased self-appreciation, when we get many retweets, many favourites, new followers, “likes” or comments on a blog post? Even more-or-less subconsciously, I think many look at these numbers, judging, at least initially, a person’s social media account from the amount of followers. These are numbers… but they get a (social) meaning. 1 – Cambi, F. (2008). Introduzione alla filosofia dell’educazione. Editori Laterza. 2 – Striano, M. (2004). Introduzione alla pedagogia sociale. Editori Laterza. 4 – Hemmerdinger, JM, Stoddart, SDR, Lilford, RJ. (2007). A systematic review of tests of empathy in medicine. BMC Medical Education, 7: 1-8. 5 – Hodges, B. (2013). Assessment in the post-psychometric era: Learning to love the subjective and the collective. Medical Teacher, 7: 564-568. I am finally resuscitating my blog for #rhizo15. This seems a rather good occasion to do something I was meant to do quite a while ago! Hopefully I will manage to finish this MOOC, as I’m used to sign-up and never finish them. Except #moocmooc, that was my first – and only – completed MOOC. @kwhamon’s post attracted me immediately. Keith encourages educators and learners to sustain equanimity, just like Sir William Osler did with his medical colleagues, despite the struggle of the medical profession. I agree, we, too, should maintain certain stability, even in that complex environment of any rhizomatic course. Edgar Morin talks about the need to embrace complexity as a natural part of uncertainty, which emerges from the limited human beings’ ability to comprehend phenomena. But, how can we practice this valuable lesson? Are we teaching our students to embrace the complexity and the uncertainty of the rhizome, when we provide them with a full, comprehensive list of learning objectives (and learning material to assimilate), which barely leave space for subjectives to emerge? In my – relatively short – experience at University, I notice very little acceptance and flexibility towards complexity and the uncertainty it brings. Many students want to know exactly what information they need to master, and be sure, in that way, that they will pass the exams. This doesn’t leave space to exploration of different, but maybe more exciting, paths. Students seem to look for the certainty provided by the pre-traced track of defined learning objectives, rather than the freedom of following “subjectives”. Is this maybe a reaction to the easier access to digital information? I do think this can be overwhelming, and rather than embarking in content research, selection and critical evaluation, it is definitely easier to be provided with the pre-packaged information to study. Building – or, more precisely, pursuing – learning subjectives requires independent, critical skills. Designing others’ learning when we don’t know where we are going is complex. There is a delicate interlace of elements that (un)balance the freedom of personal preferences and the direction and support we need to provide students, in order to help them pursue meaningful and contextual learning. Why go through this path then? And, as Dave asks, what can we get done with subjectives that can’t be done with objectives? I see the two things a bit like visiting a new city by following the touristic paths from a map and visiting the same city without a map, half wandering around, stopping to check the hidden, little shop, walking through a tiny passage just because there are lovely coloured doors in it, turning right because there is a signpost for the Colosseum, but then turning left again because there is an interesting, broken column I must check. What’s the difference? In the first case I will surely view the most salient archeological monuments in less time, in the second case I will still see some of them, but I will have discovered things that are interesting to me, even if they are not defined “archeological monument”. I will probably have gotten lost and wasted time, stopped to ask information, met people, and learned my way through. This path will have maybe taken more time (or less! ), but taken me to different streets and enriched me in different ways. In real life I do both, really. It depends from the context, the people I’m with, the place I’m visiting. I still need to define my personal meaning of the word subjectives, but I think with them we can better develop our personal agency, and, to cite Vygotsky, move through and across different ZPLs to reach unexpected learning. The structural paradigm of Social Network Analysis (SNA) with its constitutive theory and methods, began to emerge around the 1930s, applied and influenced by a broad range of disciplines such as sociology, psychology and statistics (Scott and Carrington, 2011). In social network theory a social structure is represented by a group of “social actors” connected by a set of relationships. These actors – or “nodes” – can be individuals, groups, institutions, organisations or even Web pages. There can be many different kinds of relationships – or “ties” – between nodes, which constitute a “map” of connections between the actors in a network. When a social network is visualised the nodes are usually represented by points and the ties by lines linking one or more nodes. 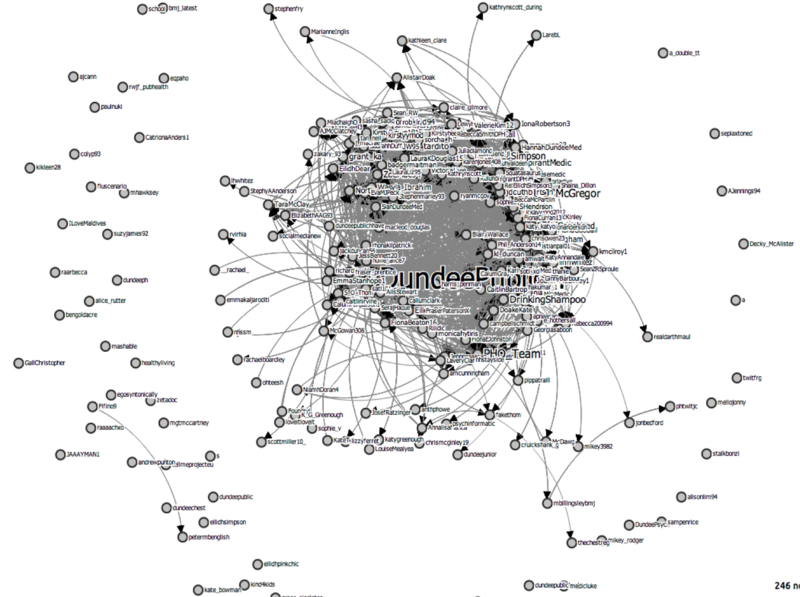 A visualisation of the network involved on a Twitter chat for Public Health teaching we ran at Dundee Medical School in 2012. Created with TAGSExplorer. The focus of SNA is on the relationships between nodes and the structure of these connections. The object of study is the pattern, nature and dynamics of these interactions, as opposite to the individual characteristics of the actors. This representation allows analysis of the social processes determined by the relationships between the individuals (Martino and Spoto, 2006). SNA enables to visualise the position of a social agent within a particular network, however, because less importance is given to individuals, this theory has less consideration for the influence of personal characteristics and individual agency in determining the success of a relationship. The connections within nodes in a network facilitate exchange of “resources” which can be influenced by the quantity and quality of the linkages and interactions. Looking at online educational networks through a SNA lens is a way to establish wether the ways in which individuals connect with a particular environment may influence their access to information and knowledge. As Rita Kop states “the Web is portrayed as a democratic network on which peer to peer interaction might lead to a creative explosion and participative culture of activity” (Kop, 2012 p3) but how is this potential being exploited in education? What are the processes beyond this interaction and how can they be used to facilitate students access to information, knowledge and ideas? The potential of social media in forming networks, extending students knowledge and translating this into academic achievement is impacted by a multitude of elements such as individuals’ attitudes (Morrison, 2002), University environment and socialisation processes (Yu et al., 2010). Other mechanisms influencing this process may be the particular educational practices and experiences, the success of connections, the dynamics in which participants negotiate the structure of the network and exchange practices and many others which can not be controlled. This analysis can be enriched by Bordieau’s concept of “social capital”, which introduces a set of dynamics between the social dimension, the identity dimension (habitus) and the individual’s practice. In this system of reciprocal influences it is interesting to look at the transformation processes and effects of elements such as “weak ties”, “brokers”, “latent connections” and “structural holes” in the information flow within a network. Acknowledging the potential of these processes and of the structure of a network is vital for educators who aim to harness the changing affordances of Web 2.0 technology applied to pedagogical interventions. According to Morrison (2002) the configuration of the network structure has an important role on the learning processes occurring during socialisation (p 1157). This is confirmed by a recent study on student engagement via social network where Badge, Saunders and Cann (2012) suggest that “where online communication channels are adopted, teaching staff need to ensure they have adequate network connections with all students, but especially to cultivate connections with and the networks of lower-performers” (p11). Student learning is influenced by the quantity and quality of connections in a network and by the students’ position in the network, which is determined by both giving and getting information from other student (Hommes, 2012). Badge, J.L., Saunders, N.F.W., Cann, A.J. (2012). Beyond marks: new tools to visualise student engagement via social networks. Research in Learning Technology. 20:1-14. Hommes et al. (2012). Visualising the invisible: a network approach to reveal the informal side of student learning. Advances in Health Sciences Education, 17(5), 743-757. Kop, R. (2012). The Unexpected Connection: Serendipity and Human Mediation in Networked Learning. Educational Technology & Society, 15 (2), 2–11. Martino, F. And Spoto, A. (2006). Social Network Analysis: A brief theoretical review and further perspectives in the study of Information Technology PsychNology Journal 4(1), 53 – 86. Morrison, E. W. (2002). Newcomers’ relationships: the role of social network ties during socialization. Academy of Management Journal, 45(6), 1149–1160. EduLabyrinths by Annalisa Manca is licensed under a Creative Commons Attribution-NonCommercial-ShareAlike 4.0 International License.